NEW ORLEANS — WHEN DXC Technology, the Virginia-based global information technology giant, announced plans last year to build its latest "Digital Transformation Center," more than 30 cities threw their hats into the ring to host the facility. The lure: the project would create 2,000 high-paying tech jobs – averaging about $63,000 annually – over the next five years. The winner? A city more known for gumbo than gigabytes: New Orleans. Indeed, Greater New Orleans Inc., the city's economic development nonprofit organization, noted the 2017 win was ranked by many who follow economic development as second that year only to the announcement that Foxconn, the Taiwanese manufacturer that makes electronics for Apple, would invest billions in a Wisconsin plant. And in a move whose symbolism couldn't be missed, DXC, with revenues of about $25 billion, leased multiple floors in the Freeport-McMoRan building, across the street from the iconic Mercedes-Benz Superdome, to accommodate the 300 hires that comprise its first batch of employees. The Central Business District high-rise was long a symbol of the city's economic reliance on the oil and gas industry, housing the world headquarters of Freeport-McMoRan, the energy and mining giant, which quit New Orleans for Phoenix in 2007. A jazz band marched up and down Poydras Street to celebrate DXC's grand opening. New Orleans, a city long hanging its economic fortunes on energy, tourism and hospitality, is remaking itself into a bona fide tech hub. Since 2006, the city has lured more than 45 high-tech startups or subsidiaries, among them Accruent, an Austin, Texas-based provider of software-based inventory systems; Gameloft, the French mobile video game giant; and GE Digital, a cloud-storage and systems software company. The result is the creation of more than 20,000 jobs, including about 3,000 jobs that GNO Inc. estimates that its targeted recruiting efforts have brought to the city. Tech companies are coming for a lot of reasons, economic and cultural. For one, the state of Louisiana, hoping to juice tech employment statewide, offers a 25 percent tax credit on qualified payroll to companies that move all or a portion of their technology operations to the state. Millions of dollars of state and city funds are also being funneled through local universities to help train prospective employees. And in 2008 the city spurred the renovation of an 85,000-square-foot office building on storied Magazine Street – called the I.P. Building – and turned it into a state-of-the-art tech facility "that hipsters in San Francisco would be happy working in," says Michael Hecht, GNO, Inc.'s CEO. As alluring, a three-minute drive or eight-minute walk away from the IP hub is, by example, Cochon, a wildly popular New Orleans eatery (think black-eyed pea gumbo and char-grilled oysters) that symbolizes one of the most vibrant restaurant scenes in all of America. New Orleans' reputation for food, music, livability and affordability is turning out to perhaps be the biggest incentive of all. "We're a low-cost, high-culture city," Hecht says. "We're San Francisco, but at half the cost – and with nicer people." Don't take Hecht's word for it. In 2011, when Gameloft, the Paris-based maker of downloadable games for the iPhone and other mobile platforms, decided upon New Orleans as a U.S. hub, it fretted briefly about attracting programmers to a city not yet known as a tech haven. It needn't have worried. With GNO, Inc.'s help, Gameloft attracted 17,000 applicants – for 15 available jobs. This doesn't surprise Robert "Bobby" Savoie, who in 2008 founded Geocent, a supplier of information technology and engineering services to clients that include the National Aeronautics and Space Administration and the U.S. military, and has grown it from a startup with 10 employees to about 300 today. Savoie sees a steady stream of applicants fleeing high-cost places like California's Bay Area where seemingly well-paid engineers "have to get roommates because they can't afford to live alone." In the New Orleans area, by contrast, "our real estate prices are unbelievable," according to Savoie. "Our programmers and engineers can afford to buy their own places here. A young couple can afford to raise a family here." That's also been the experience of Lucid, another 2008 startup that has grown from a handful of employees to 300 today – half of them in New Orleans – by figuring out how to vastly speed up market research and polling. Patrick Comer, Lucid's founder and CEO, says he was motivated in part because his wife is a Louisiana native and as a couple they wanted to be part of the city's rebuilding efforts after the devastation of Hurricane Katrina in 2005. Comer, who had worked for years in the tech hotbeds of California and New York, worried, however, whether the go-go, always-switched-on pace of the industry was a good fit for a place known for its laid-back temperament and sybaritic ways – since the early 1900s, New Orleans has been known as The City That Care Forgot. What he's learned is that the city's temperament is actually a potent draw for the techie mindset – techies tend to be people who like to work hard and then play hard. "Only about a quarter of our employees come from Louisiana," Comer says. "We are relocating talent to New Orleans because they want to come here. The cultural authenticity of the city is extremely attractive to them." Put another way, Lucid employees can put in 12-hour days and, in New Orleans after hours, still find food, music and a party scene. "We've learned that, yeah, our employees can take a day off for Mardi Gras and still be delivering for us at a very high level," Comer says. Also, echoing Savoie's point: "We pay California salaries and our employees enjoy a New Orleans cost of living. That's huge." The city still poses challenges for employers and employees alike. Crime, while trending downward for the past two decades, remains a problem. New Orleans' murder rate, for example, ranked fourth among cities of more than 250,000 population, according to a 2017 FBI report. Potholes still plague a lot of city streets and the New Orleans K-12 public school system – while vastly improved over the dysfunctional one that existed before Katrina – is still a work in progress. Summers swelter here and, despite much improved levees, New Orleans still faces annual threats of destructive hurricanes. That said, mild winters offset those sweltering summers and the network of city-based universities – Tulane, Loyola and the University of New Orleans, among them – has drawn high praise from a number of the tech companies that have moved here since the boom began in 2007. In fact, university-industry partnerships have become a prime feature of the city's tech attraction. Consider a UNO-GE Digital pact called the Software Engineering Apprenticeship Program, SWEAP for short, that since 2014 has placed more than 50 participating students in well-paying GE Digital jobs. The program assigns senior software engineers to mentor students in class while they also get hands-on training at GE Digital's New Orleans tech center. For Kevin Dawson, a GE Digital vice president, the mix of attractions – culture, costs, livability and access to a well-educated, motivated workforce willing to come from all over the U.S. – makes New Orleans' a no-brainer. About half of GE Digital's New Orleans workers come from elsewhere and the rest are locals. "Louisiana is full of incredibly smart, tech savvy, resilient people who are deeply tied to their communities; they want to live, work and have families in the place they love," he says. "The region has an excellent university system, a diverse workforce and a deep cultural understanding of life-work balance. These characteristics make it an excellent place to hire, grow and retain amazing technical talent." It doesn't hurt that the rest of the city is also doing well economically. Since Katrina, downtown New Orleans alone has attracted about $7 billion in investment, notably in the replacement or renovation of hotel rooms, apartments and condominiums damaged by Katrina or new construction to meet a post-Katrina surge in tourism and housing. In 2017, for example, New Orleans recorded a record 17 million-plus visitors. Perhaps one impetus: in Travel & Leisure's 2016 rankings of the 10 best cities for food in the U.S., New Orleans ranked first. 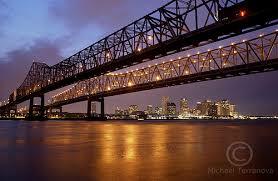 Geocent's Savoie thinks New Orleans' tech boom is poised to continue booming. "I love our company here and I love our future here. In a way, we export brains and import money," he says. "We are just on the edge of this and it is ready to explode … and where better to be than New Orleans?"